Gokarna's beaches are a breath of fresh air for an unadulterated beach experience. The beaches of Gokarna are known for their relaxed pace and tranquil waters. Unlike Goa, where the beaches are turned into party places by sun-down, the beaches in Gokarna offer plenty of quiet time. The long sand beaches here are perfect for a vacation, away from the madding crowd, especially when you need a bit of sun, sand and the sea. These are the beaches you shouldn’t miss at any rate. Perhaps one of the best beaches in Gokarna, Om Beach is a perfect place for travellers for sunbathing and swimming. However, at times the water can be rough, so be careful and know when to avoid going for a swim. While it is only six kilometres away from the main town, it’s located along a muddy hill and therefore, is accessible only by foot or by a local rickshaw. Sandwiched between two beaches in Gokarna, the northern end of Kudle Beach connects to the main beach of Gokarna, while the southern end leads to Om Beach. Head here to catch a surreal sunset; the lush carpet of greenery all around just adds to the dramatic effect. The long stretch of sand of Kudle Beach looks quite lovely in this season, with beach bums, volleyball players, musicians and backpackers lazing by the sea. Kudle Beach has a lot of cafes, shacks and guesthouses, and is highly recommended for a stay in Gokarna. This one’s an attractive cove, and can only be reached via a hike through a rugged path from Om Beach. Though it takes a good half an hour to reach this place, the effort is well worth it. There are a small restaurants that serve delicious food, and is ideal if all you want is an unadulterated and rather quiet beach experience. 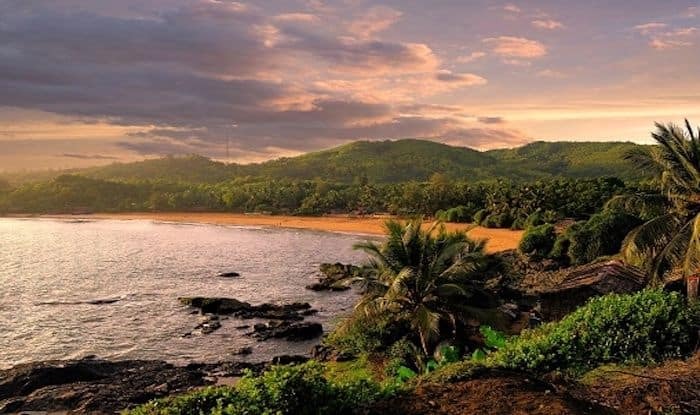 If you’re a nature loving traveller, Gokarna Beach should definitely be on your list. It’s an absolute scenic drive up to this beach; with the lush green Western Ghats on one side of the road and the Arabian Sea on the other. Since it’s a long open beach, Gokarna Beach forms the main coastline of the town. Also, this is where you can indulge in water sports such as surfing.